Rabbi Ethan Bair grew up in Boston where he was raised by spiritual seekers who rediscovered their Judaism through the Jewish Renewal movement. A graduate of Oberlin College and a former Fulbright scholar to Germany, Rabbi Bair was ordained at the Reform seminary, Hebrew Union College, Los Angeles, in 2011. 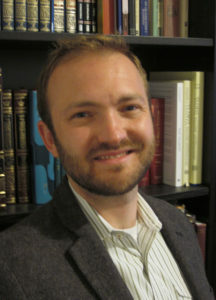 He wrote his Rabbinic thesis on “Re-Envisioning Reform Jewish Prayer,” with Dr. Rachel Adler. While in rabbinical school, he was a recipient of the prestigious Schusterman Rabbinical Fellowship, which brought together future Reform and Conservative rabbis to learn about volunteer engagement, strategic planning and synagogue management. Stemming from this experience, Rabbi Bair would describe himself as a member of a new generation of Jewish leaders for whom denominations are secondary to transformational Jewish experience. For more than 11 years he has served congregations in Ogden, Utah; Vancouver, British Columbia; Sun Valley, Idaho; and San Rafael, CA. Most recently, he worked at American Jewish World Service, a global Jewish non-profit working to realize human rights in the developing world. Before that, he served as Campus Rabbi at the University of Southern California Hillel. Rabbi Bair served Temple Sinai as our Senior Rabbi for five years before moving on to an an Assistant Rabbi position at Temple Beth Shalom in Miami Beach, FL. Rabbi Bair is committed to creating a participatory and authentic Jewish prayer culture; promoting inter-faith social justice work; and integrating Jewish studies with traditional Jewish sources into his repertoire of teaching. He enjoys running, hiking, singing, and welcoming Shabbat guests into his home with his wife, Nadya who has a PhD in Art History.